The team worked on their systems and practiced frequently, trying to keep up intensity to match the other teams still playing in their respective leagues. Chilliwack also relieved their head coach of his role just a few weeks prior to the tournament, and the move worked out. 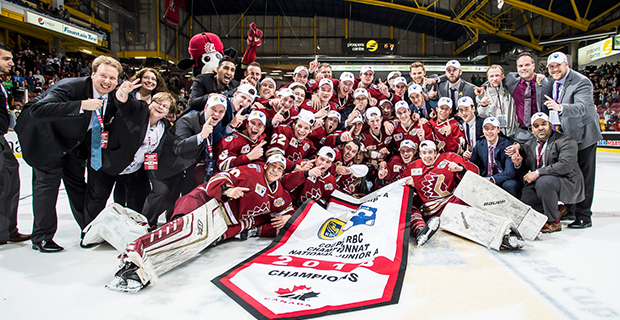 Behind three third period goals, the Chiefs were crowned National Junior A Champions on home ice with their 4-2 win over the Wellington Dukes on May 20. The Chiefs are the second consecutive host team to win the title and sixth overall. After their two-month layoff, the Chiefs played their best hockey at the right time of the year. Nearly five minutes into the third, tournament MVP and team captain Will Calverley tied the game, putting momentum back on Chilliwack’s side. Four minutes later, Corey Andonovski buried the puck and it held up as the game winner. Tommy Lee added the Chiefs’ fourth goal of the game with eight minutes remaining to put a damper on the Dukes’ charge. Daniel Chenard had 26 saves on 28 shots in the win, finishing the tournament with one of the best lines at 1.77 GAA and .937 save percentage. He stopped all 10 shots he saw in the third period. Free hockey was a theme for the week. Of the 13 games during the tournament, six of them went to overtime or a shootout. Overall, nine of the games finished with a one goal difference, a true testament of the parity of Junior A hockey across the nation. Round robin records did not appear to matter entering the knockout stage, as the 4-0 Wenatchee Wild, the British Columbia Hockey League (BCHL) Champions, fell to the fourth-seed Dukes, a team the Wild had trounced 7-1 just two days prior. The Dukes were able to pull off the 2-1 upset thanks in large part to Jonah Capriotti. The Wellington goalie turned aside an astonishing 50 of 51 shots he faced, including 16 in the final frame. Wenatchee outplayed Wellington overall, as evidenced by the 51-14 shot count, but the Dukes’ third period goal from Daniel Panetta nearly seven minutes into the third held up as the difference. Teams that have more time off that others often can lose their competitive edge, and some wondered if that would happen to the Chiefs, who last played on March 11 when they were knocked out the BCHL playoffs. Since that time, the Chiefs replaced their head coach, Jason Tatarnic, and promoted assistant coach Brian Maloney, plus hired recently dismissed BCHL coach Cam Keith to fill the assistant void. Clearly that move inspired the team. The Chiefs had the second-best record in the group stage with two regulation wins, one overtime triumph and and an overtime defeat. They were just one point behind the Wild. The semifinals pitted Chilliwack against the Ottawa Jr. Senators, who had a very nerve-racking first round, going beyond regulation in every game. Each team had at least six power plays in the contest, but neither could convert, missing some big opportunities. After tying the game up at two late in the second period, Ottawa entered the third with some momentum, however Chilliwack took advantage of their home crowd, and Kaden Pickering scored the eventual game-winner with less than 10 minutes to play. As previously mentioned, this RBC Cup was extremely competitive. While Wenatchee finished 4-0 with 10 points to win the round robin stage and earn the first seed, three of their four games were decided by a single goal and two went to overtime/shootout. The Steinbach Pistons, who finished last and missed the knockout stage since they only accumulated two points, lost twice in extra time, plus had another single-goal loss. Had Steinbach picked up one win, they would have surpassed Wellington for the final seed, dramatically changing how the knockout stage would have been played. Scouts were certainly in the stands, searching for the next piece for their NHL teams, and there are a few players that likely had more eyes on them than others. Slava Demin, a defender for the Wild, was the top-ranked player in most rankings, looking to be a second-round pick. The 18-year-old had two assists in the opening game, but did not register a point after that. Steinbach’s Matthew Thiessen is a top-10 ranked goalie in North America ahead of the draft, but he struggled in his two games, posting a save percentage below .900. He was hurt midway through the second game and didn’t get a chance to get back in net. Ottawa’s Ethan Manderville is a big centre who has scouts interested in his potential. He had a goal and assist and may be worth a late round flier. Smooth-skating blueliner Declan Carlile from Wellington had a single assist but is certainly a steady, puck-moving defenceman that could be valuable for an NHL team. Teammate Mason Snell is also a potential NHL draft pick and the defender notched two helpers. Jasper Weatherby, a forward for Wenatchee, was sensational all tournament, with three multi-point games – he led all scorers with eight points overall. After topping the BCHL in scoring, the 20-year-old could be a late round pick this year. Edmonton Oilers’ draft pick and son of new Carolina Hurricanes head coach, Skyler Brind’Amour had a goal and assist in the semifinals, finishing with five points overall. The Chiefs forward also assisted on his team’s first goal in the championship game. Next season, the Brooks Bandits of the Alberta Junior Hockey League (AJHL) will play host to the RBC Cup. The Bandits are a powerhouse every year in their league, with seven straight appearances in the third round or further, plus two trips to the RBC Cup (2013, 2017).